A cow sculpture has been stolen from a beauty spot which formed part of the London 2012 Olympics cycling road race course. The fibreglass cow, painted with Surrey Hills cycling scenes, was taken from its plinth at the top of Box Hill, near Dorking on Thursday. 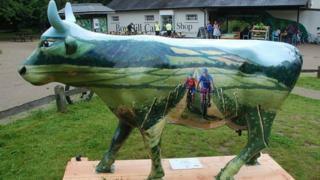 The sculpture is one of 60 decorated cows installed as part of this summer's Surrey Hills Cow Parade. It was painted by artist Charles Rowbotham. The sculpture was bought on behalf of Cycling UK and was to have been auctioned in the autumn in aid of the charity. A second cow at the Box Hill site was removed from its plinth but not stolen. Surrey Police said it was investigating the theft of the cow sculpture and appealed for witnesses.